Make your story come to life! Learning to make an animation will be a group activity that results in a 5-minute long film. An instructor will lead students to first write a short scenario for the film, decide on the type of material used for the animation – collage, plasticine, etc then use stop motion technique to make the film. This class will also teach students how to make a soundtrack for their animation that includes music and the recording of dialogue. Each class will begin with the viewing of famous short animations, from European arthouse to films by the NFB. Teamwork is a big part of this class, along with learning about storytelling, and the detailed-oriented and labor-intensive craft that is required to make a successful animation. Envision, Design, Create. 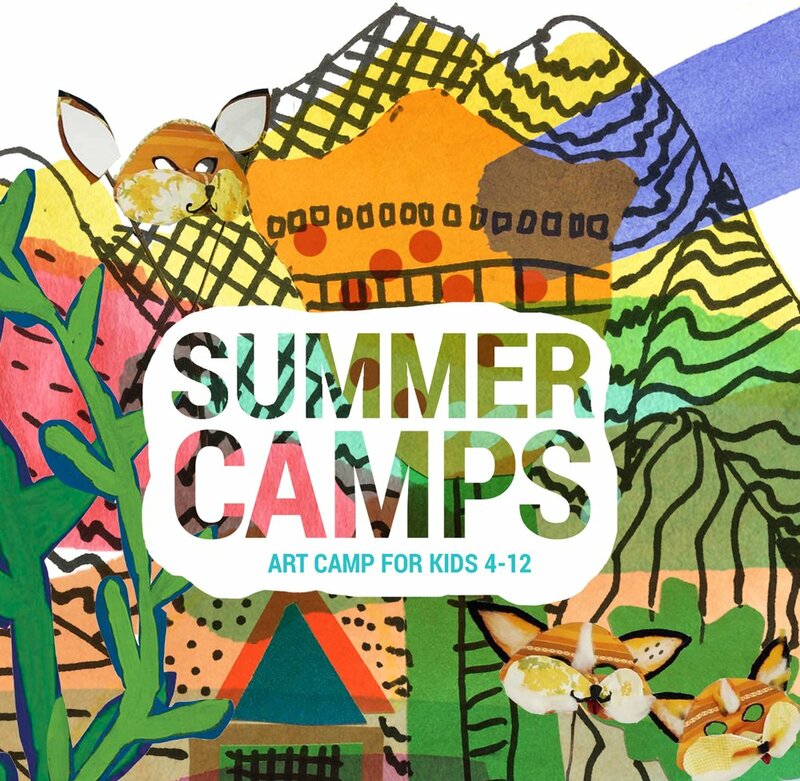 This week-long summer camp is a great introductory way for children to understand the basics of architecture and get hands-on experience of creating real structures. Our aim is to lead students toward a sensible observation of the environment, find the problems, and through their own creativity solve the problem that they are facing. We want them to focus on the built environment, look at details, and understand their connections -those which exist between spaces and the people living or interacting on those spaces. This course uses a combination of skills in drawing, painting and animation. The emphasis will be more on the process of creating a narrative while also refining artistic technique. Students are led by instructors in a process of conceptualizing a story, and then deciding how to break that story down into the building blocks of a narrative. The basic components of the exercise will include learning about scene and location, character and characterization, time and sequence, voices in a story, points of view, and narrative resolution. The course provides hands-on experience that’s highly applicable to writing fiction, creating animations and filmmaking, as well as non-fictional pursuits such as news reporting. Classes will use classic works of graphic fiction such as TinTin and Asterix, among others. The CCSA takes a special approach to teaching painting to kids by showing them how with simple techniques they can become accomplished artists. The class starts with kids learning the forms and lines, and soon moving onto draw shapes. In our classes we always encourage adding a story to this process. An important emphasis of the class will also be to clarify just how wide the latitude is for self-expression in painting. There is no standard of perfect verisimilitude students need to work to (as is typically found in the mass media). Through the use of proper techniques, students learn that any image can be made perfect in different ways. Classes include the study of art history, including the painting styles and techniques of a broad range of artists. A summer camp that will never go out of style. The emphasis of this class is to learn the basics of drawing and clothing construction for fashion design, rather than an approach focused on fashion tailoring. The children will learn how to construct a fashion item, examining the kinds of thinking that go into this process. During the week the students will learn about sketching and designing for fashion, and gain a better understanding on fabric selection, sewing techniques, garment construction, pattern making, and and proportionate measurements. Examples from the history of fashion design and style will be studied, along with discussion about current trends of those that can be found in contemporary fashion magazines. The class will conclude with a special “cat walk” show of student creations. Perhaps more than any other art, filmmaking is a team effort. In this class, kids and teenagers can learn valuable lessons about the collaborative filmmaking process. Students are given the opportunity to be both the director and actors in the class productions — each student making their own 5-minute film in a team collaboration that involves the help of their fellow students. For each film production, students will write a short script and learn the fundamentals of set and sound design, make-up and costuming, shooting and editing (Adobe Suite software will be used). Each class will begin with the viewing of famous short films, from European arthouse and avant garde works. The class concludes with a small party for the presentation of the finished filmworks. The School will help students with the application process for film festivals that accept work by young filmmakers. The show must go on! During the week of camp, the students will be introduced to theatre skills like improvisation, character-building, creative movement, vocal work, and how to develop a good on-camera presence. The camp will begin by involving all the students to collaboratively build a story and assign characters under the instruction of the drama teacher. Over the following days, the students will practice their character, work with the script in a team setting, and be prepared to perform on stage and on camera! Each week of the camp will produce a short on-camera piece for every student to take home, as well as a short performance presented for the parents on the last day. The CCSA provides a digital camera for each student to use during classes. Students are also welcome to bring their own camera if they choose. Initially, classes will focus on black and white photography, to allow students to gain a better understanding of composition; later classes will focus on color photography. Weather permitting field trips in the neighborhood provide opportunities for children to see their immediate surroundings in a new light, using their cameras as a framing and compositional device. Studio based classes will focus on portrait, figure studies and still life photography. Our sculpture classes emphasize working with an unlimited choice of materials to create a three dimensional object, a way to help students to expand their imagination. Students learn about sculptural techniques, along with the role that form plays in the construction of objects. We practice carving, modelling and assemblage, while studying examples of traditional sculptures (which tend to be figurative) and comparing them to the modernist sculptural artworks (which are often abstract). Occasionally, we invite guest artists to visit the school to teach students how they make a sculpture. At other times, our classes are off-site, providing opportunities for students to create an object outside of typical boundaries. Kids will learn a range of techniques in this course, with the overall goal of understanding the roles that shapes and patterns play in artistic composition. Early exercises will involve masking techniques and special fabric paint to create simple patterns such as using tie-dye and other materials. Lessons will then move on to experimenting with ready-made stamps on fabric. Finally, students will make their own stamps, adapting found items or working with modelling clay etc. Classes will be accompanied by short lessons in the history of textiles and printing. Inspiration and a deeper understanding will come from study of the rich global legacy of patterns – as made by humans and the natural world. This is a course in free-form art making. Children are free to bring their own materials to class (for instance: sticks, stones or preserved leaves or old magazines or other discarded paper materials) to use in the creation of sculptural constructions and installations. A class for open-ended play, Creative Practice allows kids to experiment with a range of arts — drawing, painting, collage, and sculpture— with the instructor guiding the students to combine practices and materials into the creation of 3D works.